A rose is a rose is a rose is a Rosé! Our second quarter Wine Club gathering will be held on May 12th from 6pm – 8pm and we will be releasing our long-anticipated 2017 Rosé that will be paired with food catered by Six Star Events out of Winchester, VA.
As always, reservations are required so that we can provide our caterer with an accurate account for food. This event is for Wine Club members only! We regret that we cannot accommodate guests due to the large number of members in our wine club. The word ‘clone’ inevitably conjures up futuristic images of life created in laboratories. Yet its origins were in ancient Greece where, revealingly, the word means ‘twig.’ Almost certainly the twig in question was the shoot of a grapevine. All that is required to propagate a grapevine is the cutting off and sticking in the ground of a generative part of the vine, either a shoot or a root. Once a grape variety is established it is capable of identical reproduction over centuries because each vine contains exactly the same genetic material (apart from small mutations we will return to in a moment), as the original mother vine. Taking a step back, grape varieties are formed through cross-pollination. Until very recently this occurred by happenstance rather than design. An example is Cabernet Sauvignon, which is the product at least 250 years ago of a spontaneous cross in a French vineyard of Cabernet Franc and the white grape Sauvignon Blanc. Curiously though, grape varieties* once formed through cross-pollination do not breed true from seed, hence their propagation is exclusively through cloning. Let’s return to ancient Greece, in the time of the Trojan War. and imagine a superior alien species visited the earth then and observed the participants in that epic event. As it happened, some became favorites of our interplanetary visitors and they sought to reproduce them clonally for eventual colonization of other planets. Helen, of course, would be chosen for her staggering beauty. Achilles for his physical prowess in sport and war. Ulysses for his superior intelligence. Agamemnon for his leadership capabilities. Hector for courage. Steady workers have their value too, so a particular Greek farmer turned infantryman might be chosen for his steady productivity. And so on. The clonal selection of grapevines is not different. Remember, there is a single mother vine for every variety – why was that particular mother plant chosen for propagation by an ancient viticulturalist? One reason might be that it produced grapes of singular elegance, for example, Pinot Noir. 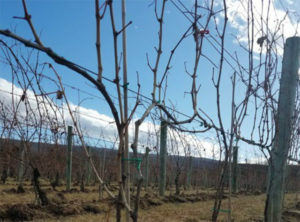 Another vine might be reproduced because of the abundance of its crop. And yet another because of its resistance to cold, drought, or disease. And another because it was dependable and produced fruit every year. In time thousands of wine grape varieties have come into existence (Italy is thought to have at least 3,000) – but each is always a clone of the particular variety’s Eve vine. Over the years very small mutations can occur within a variety, leading to further cloning. A few years ago, it was reported that thirty-four clones of Chardonnay (a cross of Pinot Noir and Gouais Blanc) existed in France, each a little different because it was selected for propagation because of a particular attribute: E.g. clones 75, 78, 121 were selected for productivity, and 76, 95, 96 for quality. At Muse Vineyards the clones we plant are selected solely for their ability to produce demonstrably superior wine. Typically, this correlates with low yields (greater flavor concentration in small grape bunches) and small berries (a higher ratio of skin to pulp, producing more flavor, skin tannin, etc.). Winter is a good time to look closely at a vineyard’s naked vines, all of them, within their viariety, twins of identical genetic heritage. Perhaps there’s a sense of ageless belonging to be found among them. Next time we’ll think about how vines may think. April Artist(s) – All month long we are featuring Paintings in Oil, Pastel, & Watercolor by Donna Patton, Laurel Vaughan, Gilda Allen & Barbara Randel: 4 Artists from 7 East Gallery. April 28th – Join us from 5 pm -8 pm for live music featuring the improvised jazz stylings of JMU School of Music professors Bob Hallahan, piano and David Pope, saxophone! We will also have TacoPeton, a local mobile taco truck serving up tacos, hamburgers, and tortas. May 6th – Join us for our Meet the Artist Reception from 3 pm – 5 pm. Our May Artist is Ken Briefel, whose photographs combine magic and art into breathtaking pieces. Details for all our events can be found on our Facebook Page. 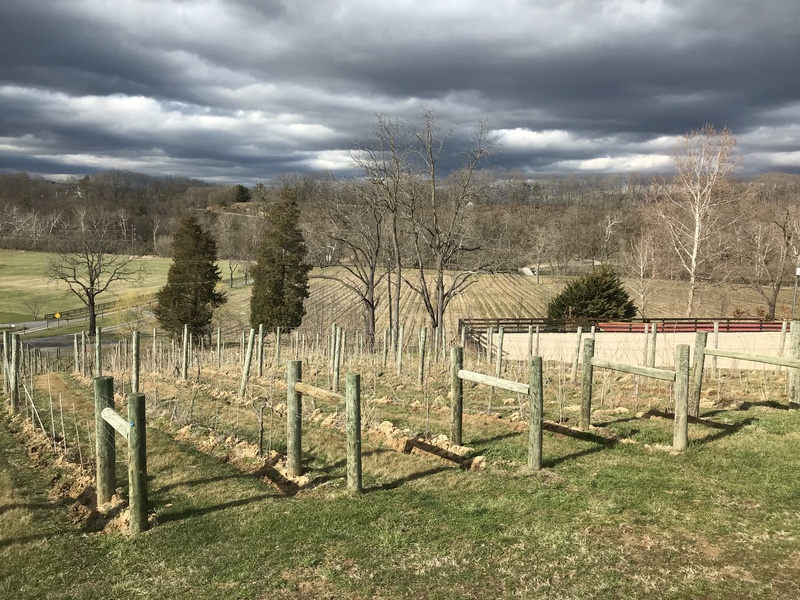 Starting Friday, April 27th our Extended Tasting Room hours will be Friday and Saturday Noon to 8 and Sunday Noon to 5. Lunch is available! We carry a variety of cheeses, charcuterie, and other snacks. On Saturdays and Sundays during winter months we have soup and other hot items (Ravioli for example) , and on Saturdays and Sundays in the warmer months we have paninis and salads available. We welcome well-behaved dogs inside and outside. All dogs must be leashed at all times and are not allowed on the furniture.